Building a dedicated following usually takes years of hard work and a high quality product, unless of course you're the Dead, in which case it's really just that second part. 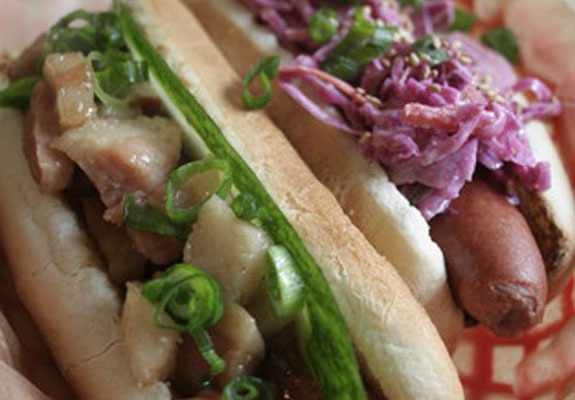 For a fusion-y hot dog joint that's already done the legwork, check out Asia Dog. Inspired by their own half-Asian-ness and a love of kimchi on their tubed meat, the couple behind this casual mashup's set up a small, wooden booth'd, Chinese takeout-steezed homebase from which to serve the enthusiastic following they built while slinging dogs all over the city, starting with Trophy Bar, then moving to the Brooklyn Flea, Summer Stage, and Terminal 5, which you can nickname your arteries if you start eating here every day. Action kicks off by choosing a dog (chicken, veggie, beef, or organic beef) to provide the meaty canvas for their pan-Asian toppings, with combos including the banh mi-style Vinh (pork pate, 'penos, spicy aioli, etc. ); the Wangding, with Chinese BBQ pork belly, cukes & scallions; and a fully Westernized joint called the Mash, covered in sweet & spicy ketchup, jalapeno mustard, and crushed potato chips, who were devastated when Ranch got even cooler than them. Backing up the tube steaks're options like a BBQ bulgogi burger (w/ Asian slaw or kimchi), a similarly topped pulled pork sandwich, and a kimchi pancake corndog dipped in their "special batter" and served w/ a Korean chili dip, though fortunately it doesn't shrink the wiener. Wine and beer're to come, but for now you'll have to sate yourself with sides of wasabi potato salad and yam fries w/ garlic curry ketchup, though if they want to build their following the easy way, they should probably cover everything in sweet jams.